The Car radio decoder unit arrived from "Electronic Sound Systems" in a large brown box. We opened it enthusiastically like children opening a present under the Christmas tree. Inside was the main processing box, a number of connecting leads ("probes") and adaptors ("pods") plus the all important Installation Instruction booklet. I would love to say that installation was easy but it wasn't. Bear in mind that your scribe is a dedicated Macintosh computer user and you will begin to understand the problem. Thankfully, the decoder software is designed to run under DOS, not Windoze, so that was one less worry. The problem was that we were trying to install the unit to a 486 PC that was already being used for office accounts and Internet connection, so both COM ports were taken by mouse and modem respectively. 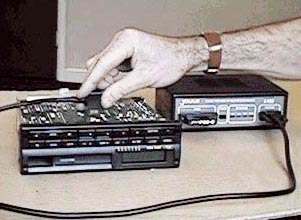 I won't recount the days we spent trying various data switching boxes, male-female adaptors and the horrors of "IRQ vectors", nor the cost of hiring a PC "expert" to sort it all out after we had tried and failed. Suffice to say that it all worked beautifully once the correct connections had been made. However, if you know as little about PCs as I do (or even a bit more) I would recommend buying a second hand 386 PC and dedicating that for use with the decoder unit. Do it that way and you will have it up and running in ten minutes by following the simple instructions in the booklet. In use, the unit is a delight. It does everything it is designed to do and the on-screen help eliminates the need for reference to the manual and the "where did I put it" syndrome! A simple menu system allows you to select the make and model of radio from dozens of choices. 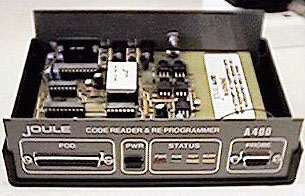 It tells you which "pod" and "probe" to connect and an on-screen diagram shows where to attach the probe inside the radio. In practice we found it useful to "Print Screen" in order to get a hard copy of the diagram whilst going through the connection and decoding routine. The starter kit comprises the software/hardware combination to decode Philips, Ford std, Blaupunkt std, JVC, Hitachi, Volvo and Panasonic radios. This kit costs £375.00 + Vat and additional software modules can be added at any time in the future. Each software module comes complete with its own data pods and probes. For anyone wishing to purchase the complete system, this comes at the heavily discounted price of £1995.00 + Vat and includes ALL available software. There's also a special version of software called 'index software'. This works on the principle that when the user reads or writes a radio code, the system displays a special index number which the user then rings or faxes through to "E.S.S.". They then enter this number into their computer which de-encrypts it and produces the original security code. The system also extracts the make and model number of the radio being decoded as well as the customers name and address for billing purposes. Codes are charged at 5.00 each. There is no rental charge for the equipment and no restriction on the number of decodes (either minimum or maximum). This system costs £275.00 + Vat and contains all available software. The prices reflect the amount of work that has gone into the design and the cost of the equipment supplied. The CE approved control unit is well made with a professional printed circuit assembly inside. I.C. part numbers had been ground off and the software has a number of security features which should keep the student hacker happy for years. These security measures and the price mean that the casual car radio thief is unlikely to have access to the unit or to a pirate copy. The "probe" leads are sturdily constructed and contain a variety of sockets and spring-loaded connectors to cope with a wide range of memory chips and microcontrollers in use today. 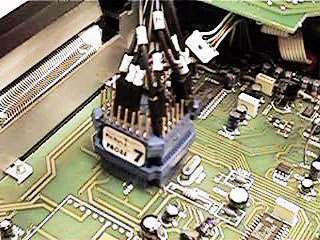 The Blaupunkt lead, in particular, can cope with a multi-pin quadpak microcontroller. Although most of the probes must be held in place by hand, it really is just a one man job to decode most radios. Once you have it working you have to make it pay for itself. We began by phoning all the local garages and electrical shops to tell them of our new service. We followed this up with low cost advert cards in local shops and post office. The system won't pay for itself for at least two years but we content ourselves with the fact that we can now offer an additional service and this actually brings in new customers who then fetch TVs and VCRs for repair, as well. As a precaution, just in case we are asked to handle a stolen radio without realising it, we record the serial number of every radio in a little book, plus details of the owner. This keeps our local Police happy. http://www.elecsys.com where you can download full details and pricing information regarding the various options by clicking DEMO. By the time you read this, the Windows version of the decoding software should be available. In use, the unit has not been without problems. On a number of occasions we have had to return it to the factory in Aycliffe to have ICs replaced. It's not clear whether this is because we connected something incorrectly or whether the design is problematic. The ends of the clip-on probes wear out quickly with use and need to be replaced, otherwise they pop off the IC while you are fiddling with the computer keyboard! And, in order to keep up to date with all the radio models and variants, we have spent a small fortune on software updates. All in all, it's very difficult to offer a service to decode every possible variant so, in practice, we work in partnership with another local dealer and take turns to buy updates. If we can't decode a particular model, we trot round to his workshop to do it, and vice-versa.